This is a homebrew regenerative receiver, mostly based on several designs by Charles Kitchin N1TEV. See the links below for an article by him. The receiver tunes the entire 30m band (10100-10150) and performs quite well. Since it is made for a narrow CW-only band, we can use a trimmer capacitor for a fixed amount of regeneration. In use, it is hard to distinguish from a direct-conversion receiver. For tuning, I use a 1N4007 diode together with a 10-turn potentiometer. In series with a 10pF fixed capacitor and in parallel with a little more than 100pF this results in a tuning range almost exactly the size of the 30m band (50 kHz). The regenerative circuit itself is fairly standard, using a MPF102 JFET and a T-50-6 toroid with a main winding for the tuned circuit, a tickler winding, and a winding to couple the common-base preamplifier stage. Audio output is coupled through the source of the JFET, through some mild low-pass audio filtering and a volume control to an LM386 amplifier with a voltage gain of 50. 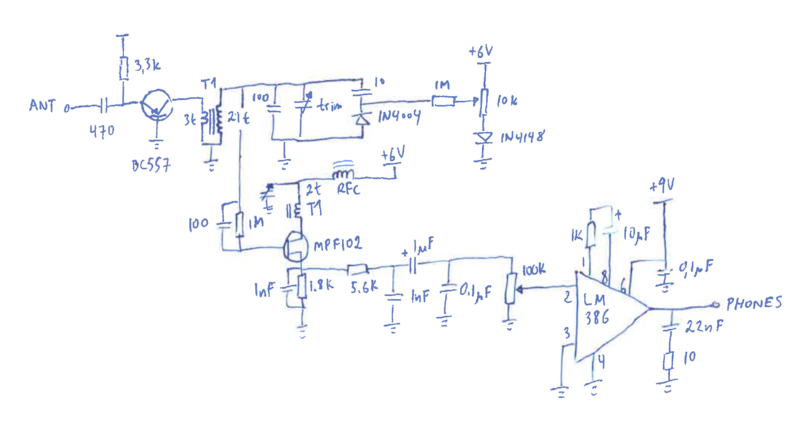 I use a 9V battery, and there is a 6V regulator (78L06) not shown in the schematic providing a regulated supply for voltage-sensitive parts of the circuit. Video of the receiver, on top of a loop antenna, with CW sounding like bird song. I made another version of this receiver, on a wooden board with a bandspread capacitor. N1TEV Charles Kitchin: High performance regenerative receiver design. AA5TB Steve Yates: High-performance JFET regen, tickler coil with capacative regeneration control, filtered audio. Rolf Heine DL6ZB: one-JFET Hartley regen, paired with a one-transistor crystal QRPP TX. Burkhard Kainka: varactor-tuned BJT-only receiver, differential 2xPNP for regeneration. Burkhard Kainka: minimalistic 1.5V BJT receiver using transistor capacitance for feedback, detector voltage for regen control. Burkhard Kainka: minimalistic 1.5V BJT receiver using transistor capacitance for feedback, detector voltage for regen control. Includes extra (transistor) audio stage. 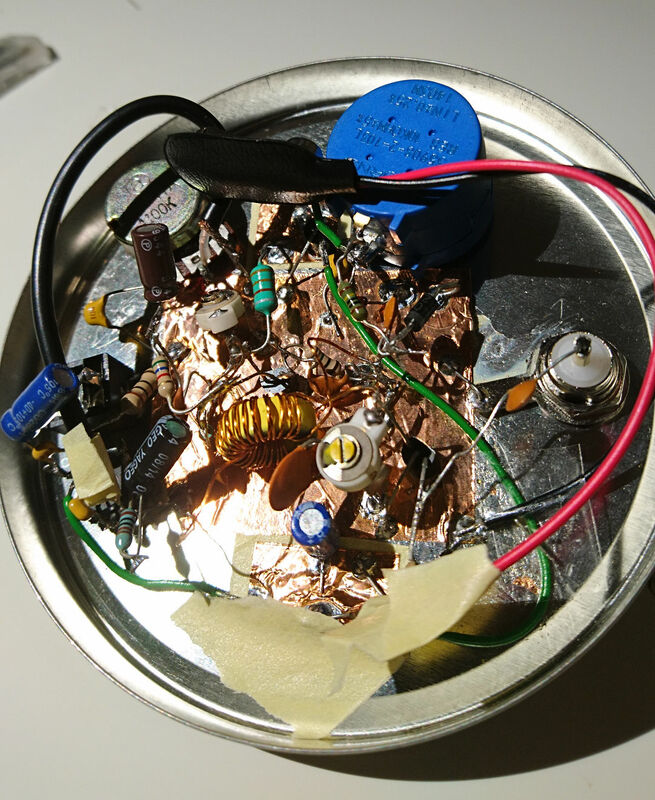 SM0VPO Harry Lythall: minimalistic 9V BJT receiver using tickler coil, circuit voltage as regen control. 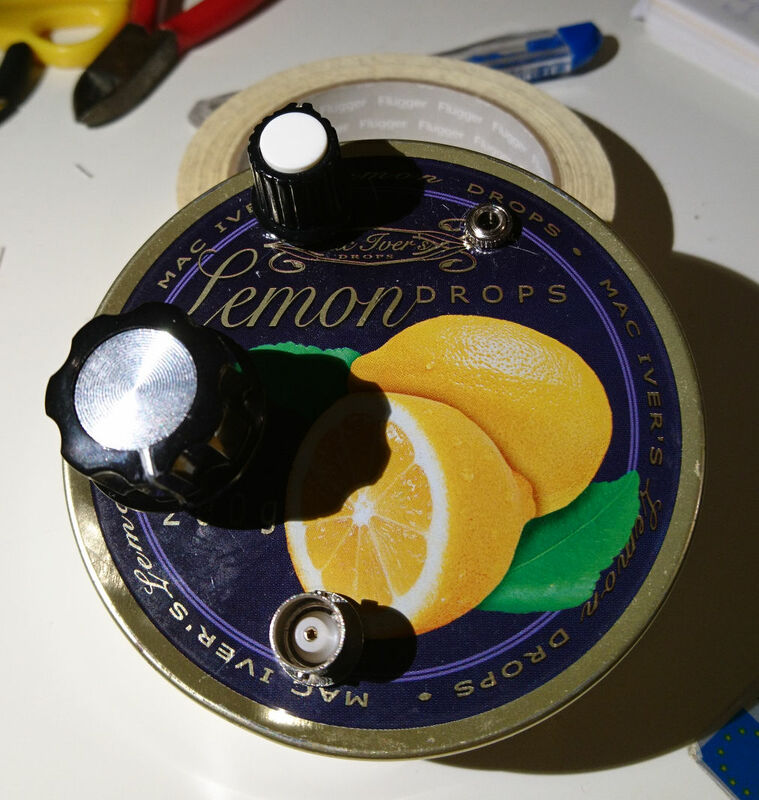 SM0VPO Harry Lythall: Two-JFET/pentode tickler coil, capacitive regen control. Mike Bittner: Three-triode Colpitts regen. VK6FH: 12AU7/ECC82 single tube (dual triode) Hartley regen. WA6OTP: several minimalistic JFET/tube regens, beautifully built. John L. Fuhring: multiple projects. Simple BJT regen with Colpitts feedback. KR1S: multi-band JFET regen, rather elaborate. Burkhard Kainka: minimalistic 1.5V AM receiver. VK2ZAY: 80m DC receiver using a diode ring mixer.